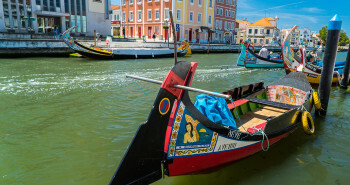 After spending some relaxation time surrounded by tiles, canals, and overly sugary treats in Aveiro, I was back in a urban exploration mindset. 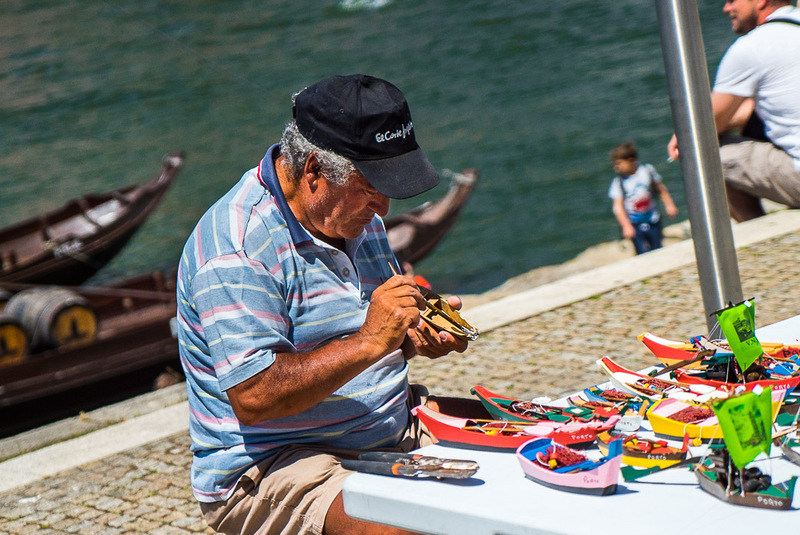 Throughout my travels here, I had heard all about Porto’s good eats, steep hills, and of course port wine, so I was excited to check it all out for myself. Not a bad way to spend my last week in Portugal! 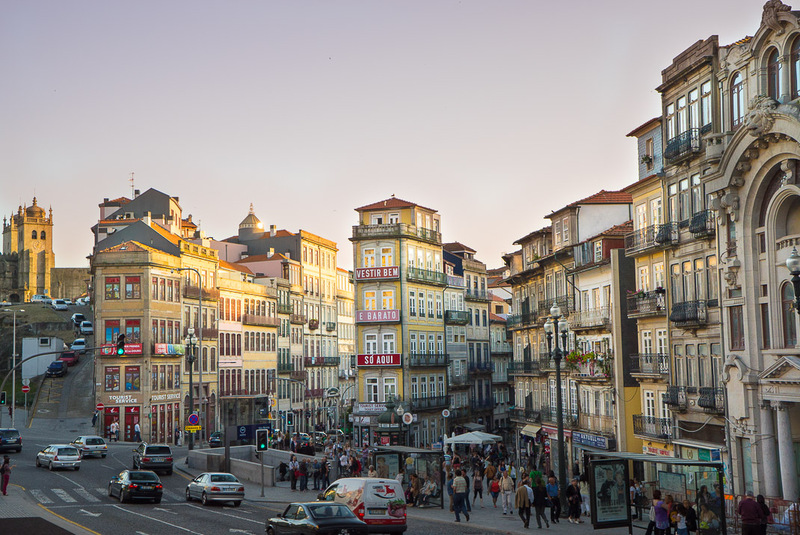 Located about 2 1/2 hours North of Lisbon on the train, Porto is Portugal’s second largest city. 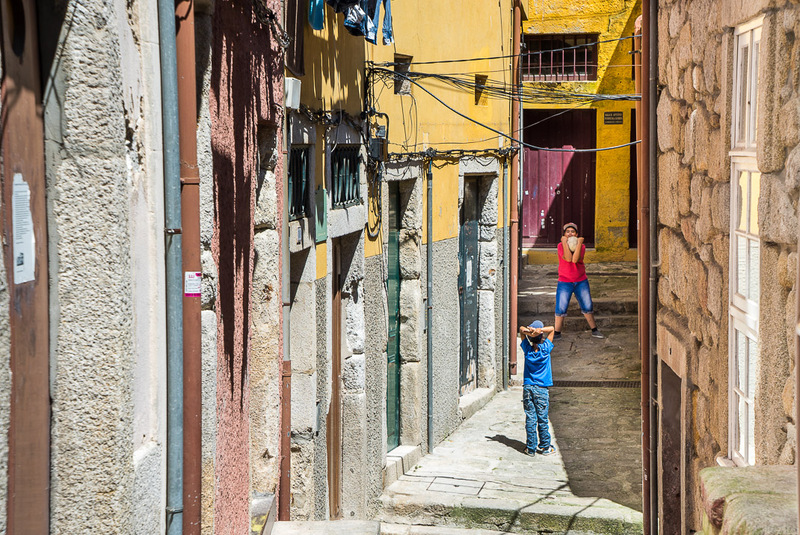 Both offer that rich lived in gritty vibe that I’ve come to love here, along with some serious steep hills. 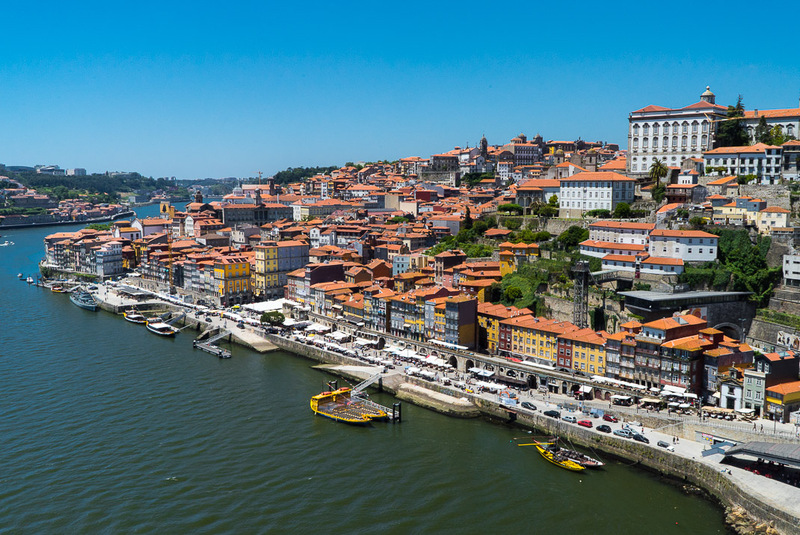 Unique to Porto though is its spectacular waterfront and historic port wine production, but more on both in a bit. After checking into my home for the next few days and introducing myself to a seriously chatty host (an extremely sweet guy who wanted nothing more than to emphatically tell me every detail about the city), I was off to explore around and get my bearings in this new place. 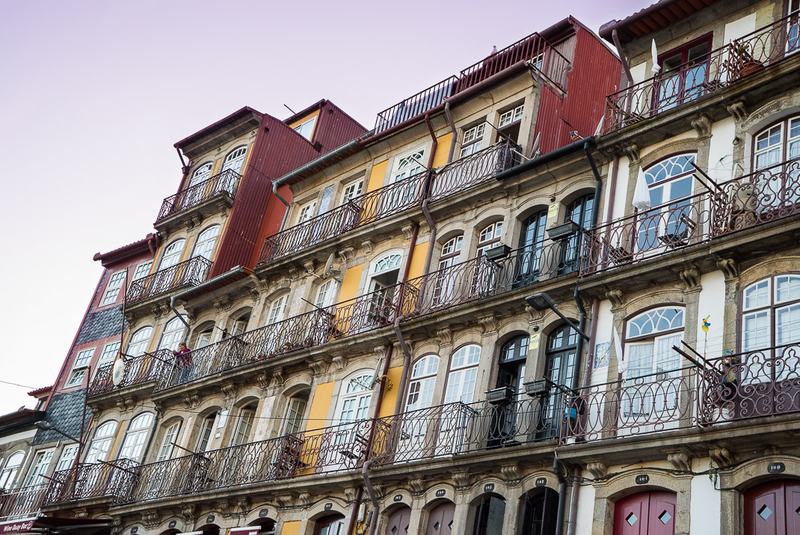 The best part about walking around Porto is that it’s impossible not to notice the colorful pulse that weaves itself through this city. Stone monuments appear to tower over bright multi-story apartment buildings. 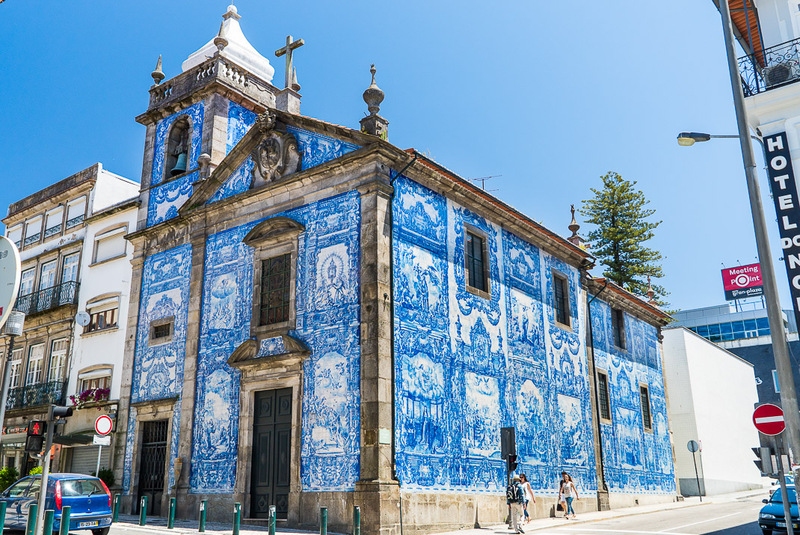 Ancient weathered churches are covered in intricately patterned azulejo tiles. It felt like everywhere I went, the colors themselves just jumped out around each corner. Before I had a full grasp on my surroundings, I descended into the waterfront area, which is just as beautiful as everyone raves about. 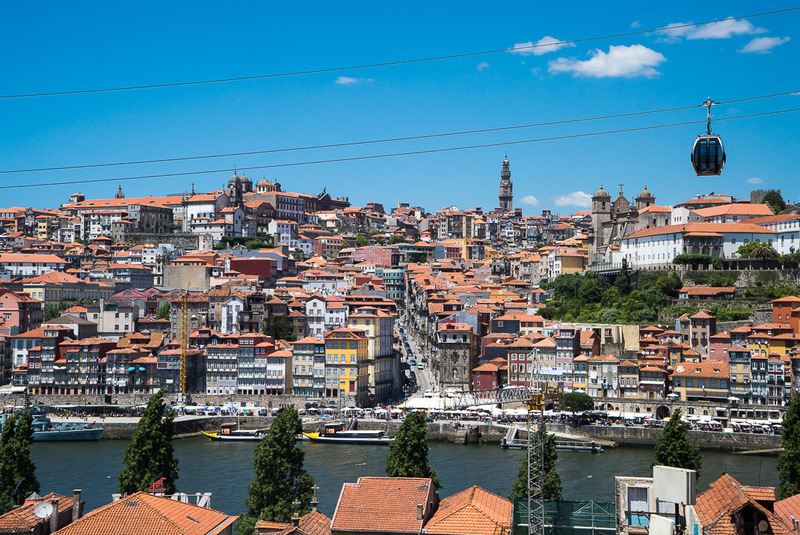 From here you can really see how steep this area of the city is and also how the Douro river separates Porto from Vila Nova de Gaia. 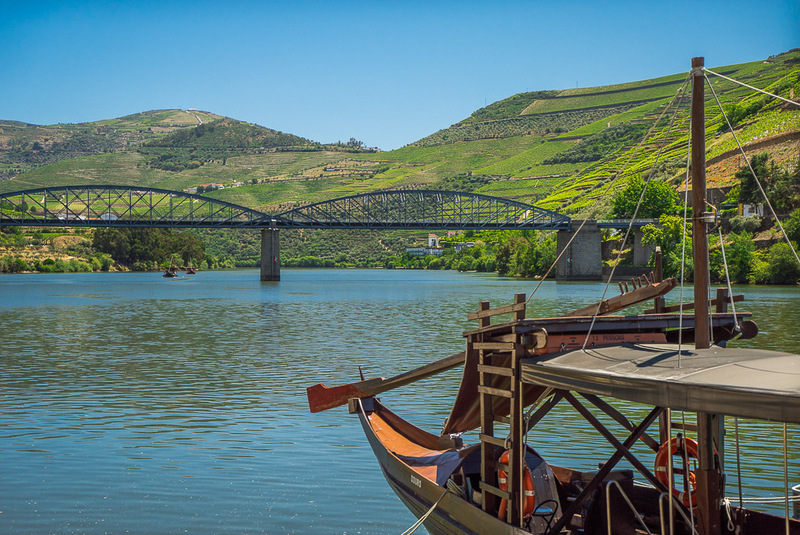 Connecting the 2 sides is the equally photogenic Dom Luís Bridge, which is conveniently easy to navigate over on foot. 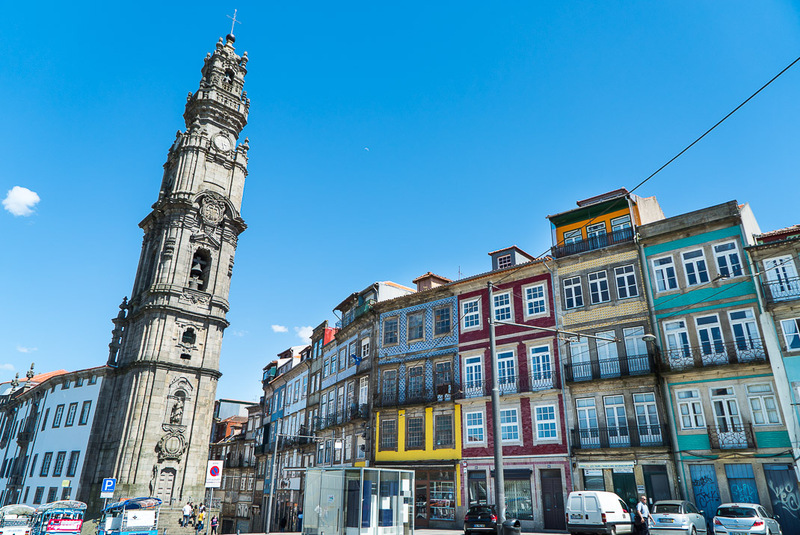 Now that I was down here, I took some time to explore the Porto side of the waterfront, hoping that I could find a nice place to grab an afternoon coffee and snack. Jammed with various different restaurants, cafes, and tented stalls selling all sorts of items, there certainly wasn’t a lack of options. Unfortunately this area was uncomfortably PACKED with people. I maneuvered my way through the various human clusters and made a couple of passthroughs to try and get a good feeling of the sights and sounds, but I just wasn’t connecting. You definitely can’t blame people for wanting to hang around here and not leave, but overall a bit too claustrophobic for my tastes. Hopping over to the other side of the river however provided a much calmer feeling throughout. 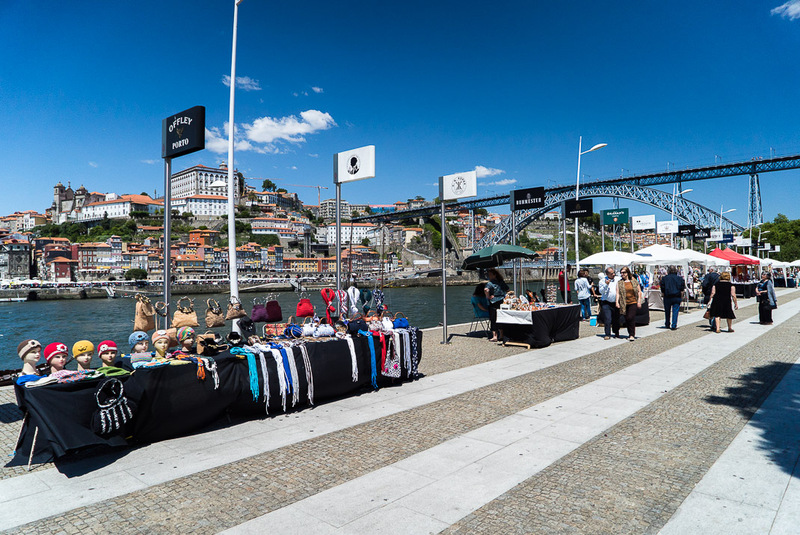 The plentiful lineup of restaurants, cafes, and stalls along the water was still present, however everyone seemed more casual and the crowds felt a bit more spread out. 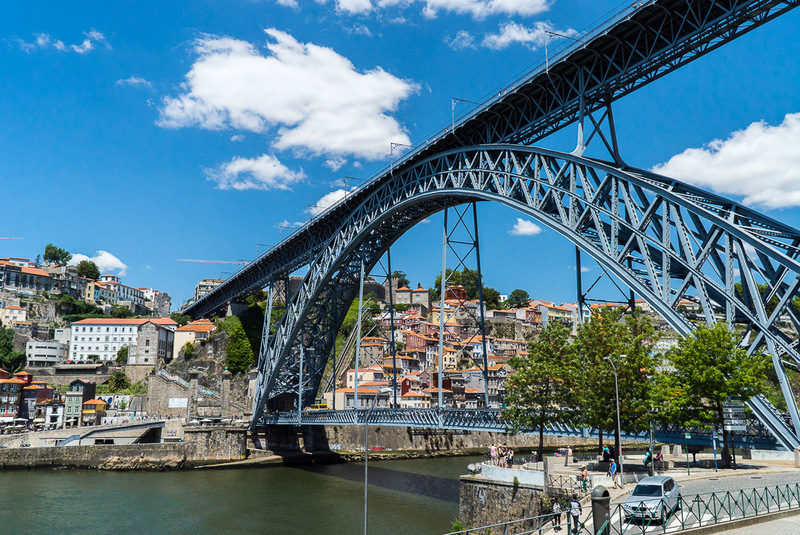 Maybe the bridge crossing proved to be too much of a hassle for some, or perhaps the abundance of port wine cellars on this side kept everyone in a consistent alcohol induced haze. 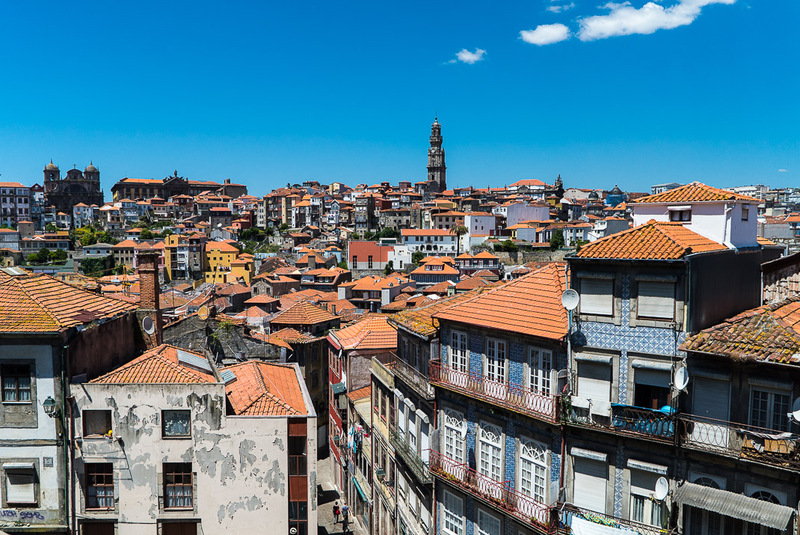 Not to mention, Gaia also offers some some spectacular views of Porto that you can enjoy from just about any angle. Speaking of these port cellars though, there are around 30+ of them up and down the long walkway, and they all offer up various different options for tasting. 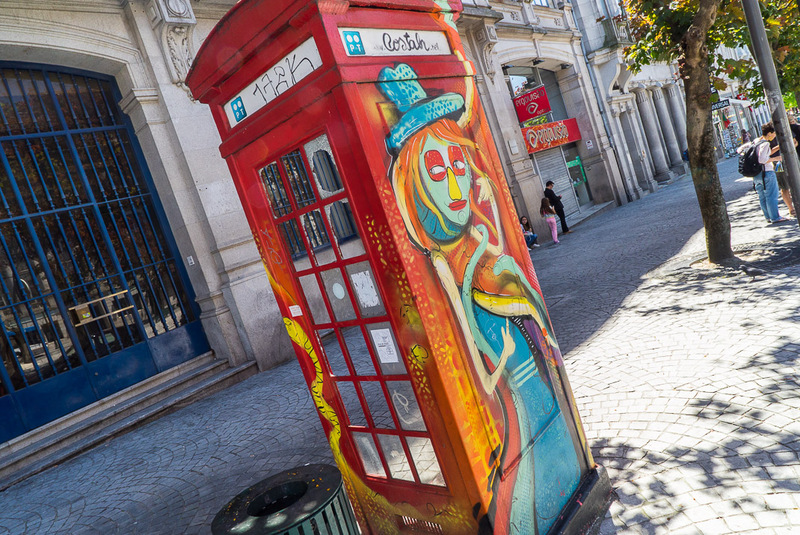 As strange as it is that these aren’t on the Porto side of the river, with it being known as the home of port and all, you won’t really care after your 3rd or 4th tasting. 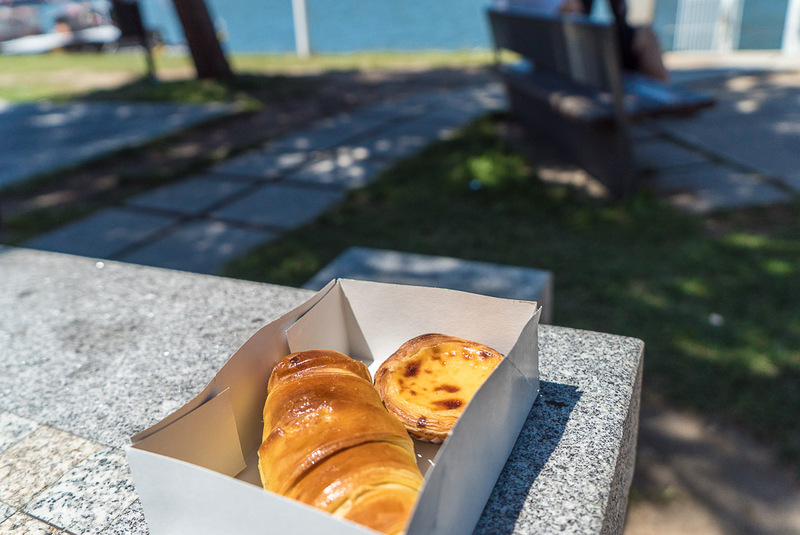 At which point, if you’re me, you probably just figure that’s it’s best to continue to wander on down along the water and grab some tasty pastries to sop up the boozy afternoon. The worst part of making your way down to the waterfront area is that you inevitably have to make the trek back up. 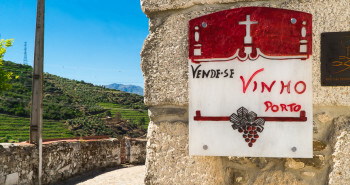 Add a stomach full of port and pastries to the mix and the trip immediately becomes a bit more… adventurous. 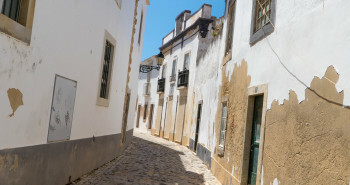 Though, rather than struggle my way up using the main streets, where I’d be on full display to all passersby, I figured I’d take one of the interesting side-alleys up. What I hadn’t foreseen was the labyrinthian layout of these alleyways. 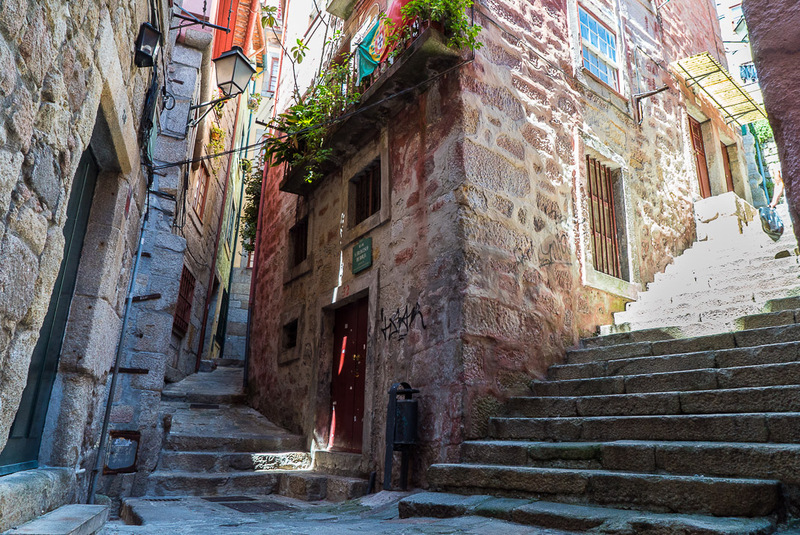 A steep set of steps would transition into a narrow walkway, which would snake around an almost vertical neighborhood and then fork into multiple different directions. 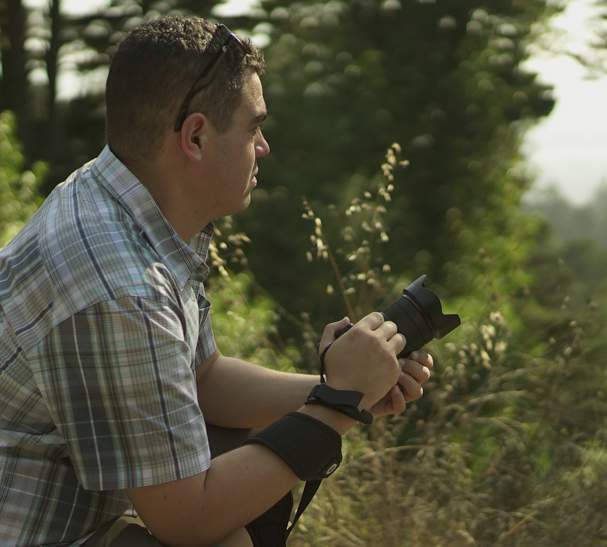 With no signage present and the tall buildings blocking any view of the outside, I took all of 5 minutes for me to completely lose my bearings. I even had to double back a few times after hitting dead ends, something that proved endlessly entertaining to a pair of kids I ran into. 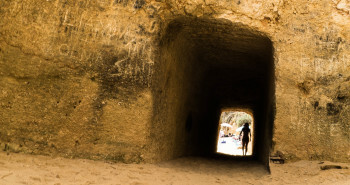 After finding my way out of the honeycomb of doom (with a wee bit of help from my captive audience of 2), I continued my way towards the center of town. All of this climbing had once again stoked the fires of my appetite, so I figured that now was as good a time as any to experience one of Porto’s signature delicacies. 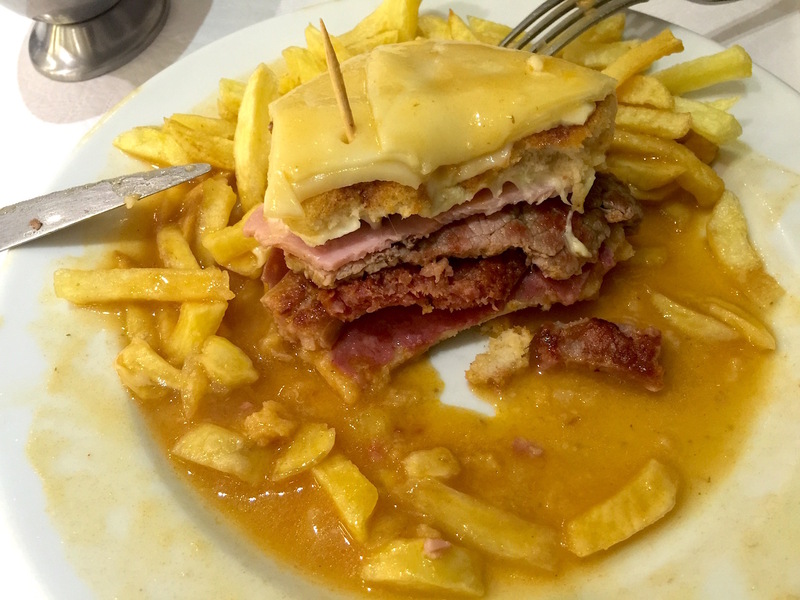 The francesinha “sandwich” is truly a staple within this city and something that just about every local emphatically told me that I had to try. You can find them everywhere, with each restaurant having their own carefully guarded twists on the core recipe. To assemble, take ham, a fresh sausage patty, cured sausage (usually linguiça), with a thin steak and place them between 2 slices of squishy white bread. Completely cover the bread with a mild white cheese and then drench everything in a thin but slightly spicy tomato sauce. 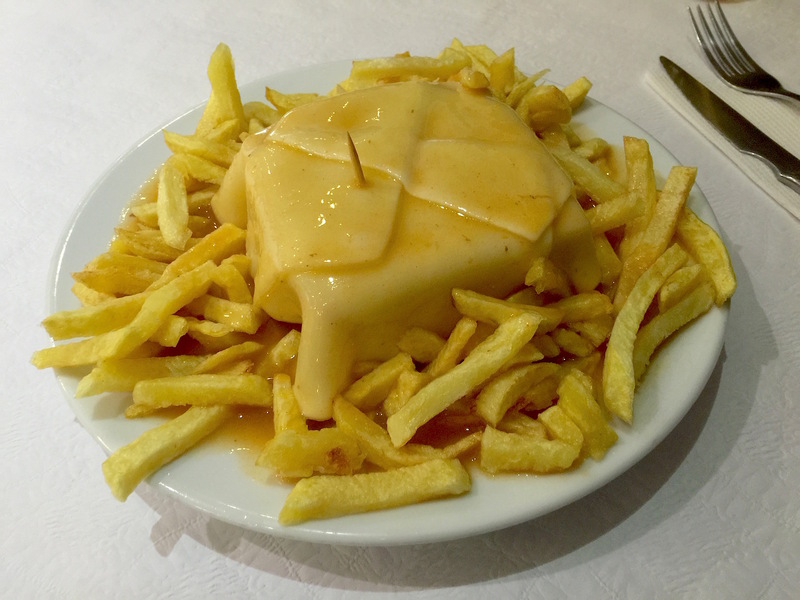 In one final hostile act before serving, completely surrounded your francesinha with french fries. It really is a complete sloppy mess of a meal with an ingredient list that looks more like the makings of a heart attack than a sandwich. After only a few bites, I was already feeling the full force effect of all that starch and rendered fat churning away in my stomach. Before too long though, my entire plate had turned into mush. At which point my digestive system just couldn’t take it anymore, so I had to throw in the towel and call it quits. I’m glad I gave this local institution a go, but all in all this was a bit too heavy for my liking. Safe to say there won’t be many more francesinhas in my future. If this sounds like your kind of thing, at Cafe Santiago (considered by many to be one of the best francesinha makers and where I ended up) you can even order yours with an egg on top. Surprisingly, just about every single table had ordered theirs this way which, I’m pretty confident, would have left me unintentionally recreating the restaurant scene from The Meaning of Life.